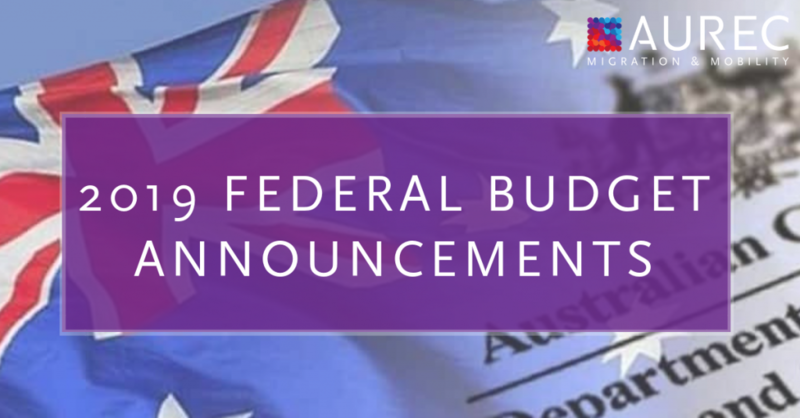 The 2019 Federal Budget, released on the 2nd April 2019, contains the following announcements and information related to the Department of Home Affairs and the migration program. Base VACs for visa subclasses, except the Visitor Subclass 600, will increase by 5.4% from 1 July 2019. From November 2019, points test will be adjusted to award additional points, to the primary applicants, where their partner has competent English, but cannot meet the requirements for skilled partner points. Single applicants will also be awarded additional points to ensure they are not disadvantaged – how this will occur has not been detailed. The Skilled Work Regional (Provisional) and Skilled Employer Sponsored Regional (Provisional) visas will be introduced from 1 November 2019. The RSMS (Subclass 187) and Skilled Regional (Subclass 489) will be discontinued. ‘Enhanced’ compliance activities will also be implemented for these visas. An additional 12 month second post-study work visa for international graduates providing a total of three years. Four new regional visa subclasses were announced in the lead up to the Budget. Skilled Employer Sponsored (Provisional) – available from 1 November 2019. Skilled Work Regional (Provisional) – available from 1 November 2019. Permanent Residence (Skilled Regional) Visa – available November 2022. Temporary Graduate visa – available 2021. Please contact us today for assistance with your visa or more information on any of these changes.